One of the keys to successful marathon training is to vary your workouts. 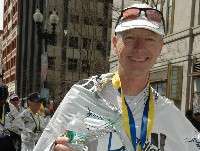 Unfortunately, many runners are challenged with having sufficient time to complete the types of exercises necessary to prepare them for the marathon. You can’t perform the same workouts at similar intensities and expect different results. 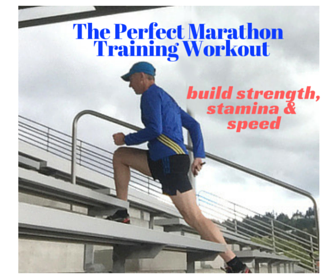 This article will give you the perfect marathon training workout. The good news is, that for no cost, you likely have access to a “universal gym” that will allow you to complete exercises that not only advance aerobic conditioning, but also improve lower body strength and help prevent injuries. If you add some track work to your workout, you can actually build speed. 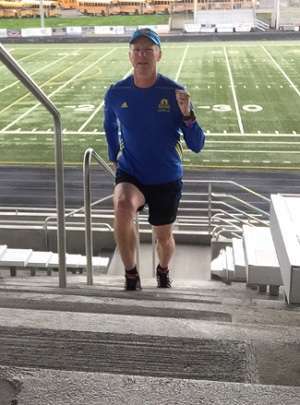 In this article, I will show how you can benefit from incorporating a few different 20-30 minute stair climbing workouts into your marathon training. Improved VO2 Max which means you can run harder and for longer durations because you have improved the max amount of oxygen used during intense training because you now convert it to energy quicker. Stronger legs, glutes, quads and calves gained without the same impact on your limbs from running. Variety for free. Stair workouts are like having a universal gym without the cost. Runners can complete numerous exercises like sprints, lunges, plyometric moves and various combinations of bodyweight exercises. See below for some workout suggestions. One potential drawback of stairs is the possibility that your stride may be shortened when you’re trying to adjust to shorter step distances. This can be problematic if you include stairs into your marathon training too often and effectively shorten your stride. Longer and quicker strides help runners get faster, so when completing stair exercises, ensure you run up with quick leg turnover. Also, incorporate lunges or “bounding” strides into your regime and try to skip every other or every third stair if you can (do so safely). 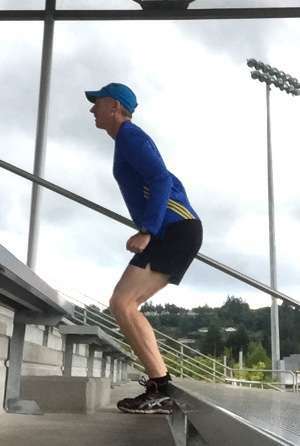 I like quick reps because the increased leg turnover helps to build speed and improve running efficiency. “Bounding” up steps by striding powerfully enough to skip to every other step. Ensure you use your arms to keep good form. Walk down. “Hopping” up the length of steps on two legs. Use your arms to swing into each hop. Walk down. “One leg hops” are same as two legged, but keep them quick. Switch legs when you’re half way up. Walk down to rest. The hopping exercises will greatly improve your running strength. CAUTION: If you haven’t done any hopping exercises, ease into this one. Trust me, you may make it through the workout, but you’ll be “whipped” the next few days. Increasing the number of intervals or rounds. Use weights (15-20 lb dumbbells or kettlebells in each hand). Completing body weight exercises between sets/rounds. b) Run to top of stadium or 10 flights (skip other step/go half speed). Walk down. Complete 3 times (sets). e) Repeat (c) except complete 4 times. Walking Lunges – concentrate on proper form to maximize the effect and build lower body strength. b) You don’t have to complete these as fast as traditional stairs. This will allow you to skip the additional step while maintaining proper form. Step up with your right foot and skip to second or third step. Ensure you bend both knees to a 90-degree angle and lower into a lunge. Next, push off with your right foot, then push up the stairs, step your left leg up to meet your right and then forward while lowering it to the next lunge. c) Continue lunging forward until you reach the top of the stairs. Keep your front knee over your toes, and chest upright. d) Walk down for recovery. e) Complete 3 sets (each to top of stadium or 10 flights of stairs). b) Start by stepping your left foot on the far-left end of the second step. Next, push off with your left foot and hop onto your right foot, placing it to the right side of next step. c) Continue climbing the stairs, while alternating sides, until you reach the top or go up 10 flights. Combination workout (1)-(3) – this workout really works your legs. 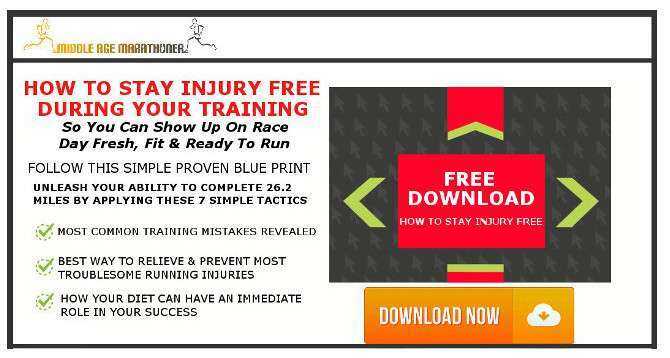 Be careful – the first time I completed this workout, I was really sore the next day. Gym Exercises – when stairs aren’t available or weather is poor. 2) Repeat for 20 to 30 minutes or complete a tempo workout for 30 minutes at a comfortably hard effort (you want to break out into a sweat and get your heart rate up). 2) Round 1 – adjust your speed and incline each 2 minutes by .5% & .5 up to 7% & 7.0 after 6 minutes. Adjust back down to 4% and 5.0 for 2 minutes. 3) Rounds 2, 3, 4 – repeat round 1. On last round, go up by .5% and .5 the last 1 minute (so you’ll be at 7.5% and 7.5). 4) Complete 5 minute cool down at 0% incline and 5.0 – 6.0 or pace that allows you to slowly reduce your heart rate. You can always add difficulty to these workouts by including body weight exercises between each rep. Consider adding push-ups, sit-ups, planks or burpees. To break up each round or set, I perform half the exercises at the top of the stairs and then the other half at the bottom. Remember that even when you’re fatigued, the most efficient conditioning occurs when you maintain focus on good form.